Operation Stack, which sees the M20 motorway in Kent turned into a lorry park to ease congestion, has been lifted after four days. Kent Police implemented the operation on Thursday as snowy weather led to a build-up of lorries waiting to board ferries at Dover. 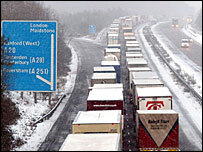 At one stage the coastbound M20 was closed from Maidstone to Folkestone. Operation Stack was lifted on Sunday morning as the weather improved and congestion reduced. When Operation Stack is in place lorries are directed onto the motorway and kept there until they can board ferries, while other lighter vehicles are diverted off the motorway and make their way to Dover on other roads. It has been brought into place several times recently after damage to a ferry berth at Calais.